Sooooooo...Kirk and Spock from the Kelvin timeline? I thought McFarlane has the whole license? Do we think this has to do with the separation of the franchise between CBS and Paramount? DST expanded their Trek license months ago, it was speculated it was the Kelvin Timeline and this confirms it. Hopefully it means ships too. 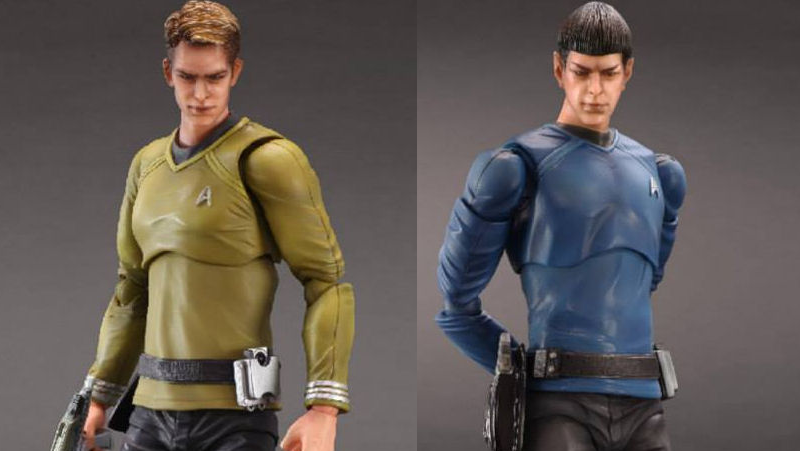 Regarding the Kelvin Kirk & Spock...why do they have the "seam" in the torso area? The Square Enix figures did the same thing. It just looks odd to me, which is why I never purchased these. Yeah I really hate that. Im glad I have no interest in the Kelvin stuff or this would be really disappointing. DST does the same thing with their Ghostbuster line which is why Ive hung onto all my Mattel figures and havent gotten into that one. Regarding the Kelvin Kirk & Spock...why do they have the "seam" in the torso area? That's upper body articulation. That way they can bend forward, backward and, if it's a good joint, sideways. But I agree, it looks stupid in this case. You just can't hide that joint on Starfleet Uniforms, so it would be better to just leave it. Starfleet Officers don't need to be THAT agile anyway. At first glance... I honestly thought the DST figures were Square Enix... obviously they aren't but Yeah... it was that mid-torso articulation that I saw and just disregarded. I like the head sculpts, but yeah that Borg was best of class IMO. I'm just happy to see DST offering Star Trek ACTION figures again. I had zero interest in their most recent Select figures that were basically statues with some posing options. The transporter bases are groovy. Hopefully DST finally gets around to offering a decent-sized collect & connect diorama like they did successfully with Ghostbusters. Never really liked the Swuare Enix figures, but it wasnt because of the torso articulation. I like the overall look of DSTs more, and will definitely buy them since I want to support the future production of Kelvin products. The Borg select definitely looks cool, but I dont have much interest in a Borg figure. I'm certainly in for these. I've wanted decent Kelvin timeline figures since 2009. The torso seam doesn't bother me, I've got all the first series Ghostbusters, and it's a lot less obtrusive in person. I wonder why they've gone with into darkness though, and not the more current Beyond Uniforms (Either the duty Uniform or the Away suits(Beyond Away Suit Kirk would make an incredible figure)). 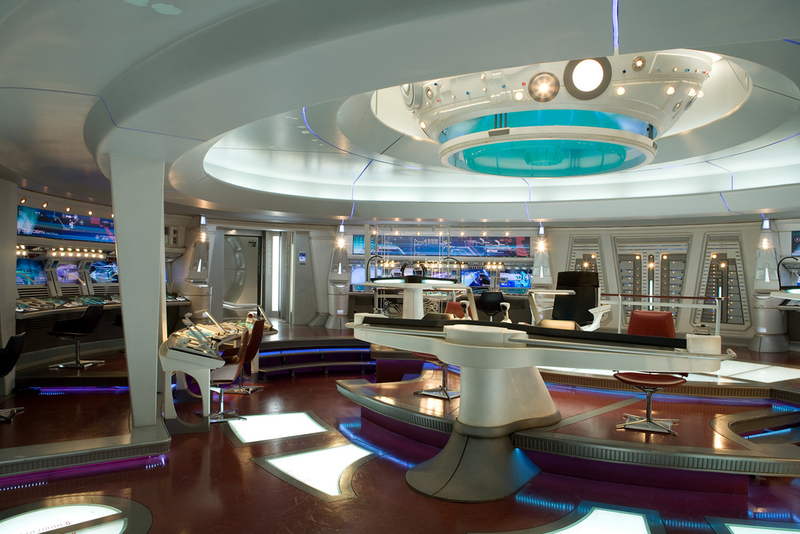 It's such a shame that Trek isn't the market force it once was, as it would be great to get a bridge like the Ghostbusters rooftop, unfortunately, the realist in me thinks these three will be all we get. I'm sure they're testing the waters like they did with the X files, but if those didn't sell, the Trek ones won't either. I didn't see any mention of accessories in the product description at BBTS, just the bases. Says multiple accessories, and they confirmed on Twitter what was shown will be included. They said they don’t like listing accessories in case something gets cut. "as well as multiple accessories and connecting transporter pads" Actually, those are floor panels on the Enterprise bridge. It is quite weird to have a world where we now have three companies simultaneously holding the action figure license - DST, McFarlane, and Mego all doing so. Do I sense a make-a-bridge if these go well due to the floor panels not being transporter pads? Thatd be amazing, but Id be very surprised if it happened.